> Threads & Trends > Blog > 10 Paw-fect Embroidered Christmas Gifts Ideas For Your Furry Friends! Looking for a gift idea for your cute, non-human companions? In this blog article we searched for inspirations to find items that can easily be personalized by embroidering lettering on them. 1. Include your pet in the celebrations this festive season! They are part of the family, so they also deserve a Christmas stocking! Feel free to design embroidered stockings for your fellow humans too while you’re at it! 2. Many of our pets wear collars as a matter of safety and identification. Why not give your pet a personalized, embroidered collar? 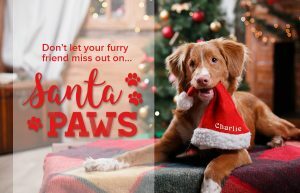 Choose or create a design of your own like paws, pet patterns, or bouncing balls and give your pet a unique identifier. 3. Sometimes our pets have to wear clothing to stay warm. Other times, it’s just plain cute! It’s even better if you add a personal touch to it. Add the logo of your favorite sports team so others will know which team you and your pet are rooting for! 4. Your dog’s paws can get really cold in the winter and you surely want to keep them nice and toasty. Label booties so they always go on the right foot by embroidering lettering on them. 5. Taking your furry friend out in the rain or snow to use the bathroom is a necessary part of pet ownership. And when they come back inside, what better way to clean off their paws than with a personalized paw towel? Embroidery can help you identify your pet’s towel in an adorable and unique way. 6. Many of us have beds for our pets (though whether they use it or not is another question). Try adding a unique design or initials to your pet’s blanket! Embroidery has been known to stand the test of time, so it’s one way to create a custom pet accessory that can take on the wear and tear of daily use by your pet. 7. A leash, aside from letting you walk your pet with no worries, is also a long piece of canvas which allows you to express how much you adore your pet. Get creative with an embroidered leash with paw prints, your pet’s name or initials, or a cartoon-y furry face. It leaves a lot of room for creativity, so let your imagination run wild! 8. Make the lead up to Christmas just as exciting as the day itself! Your pet will be pleased to receive a Christmas treat each day from a decorative embroidered advent calendar. 9. Patches can be sewn onto nearly anything and having an embroidery machine and software can make the task so much easier and a lot of fun! Create a custom logo for your pet, using his or her name, image, or a saying you relate to your pet. 10. Design your own personalized dog bandana, Go ahead and spoil your furry friends with unique adorable dog bandanas .Add their names, photos or a funny saying to create one-of-a-kind items that are just as unique as their personalities. Happy thinking about what you will design for us to make for you and your special furry friend! ← Blogging about 3 types of Printing.